It’s not me, but it’s kinda me. Image: Wikipedia. Every once in awhile, I allow myself to dip into the past and see what was what when the Earth was last in this exact(ish) spot in relation to the Sun. That is how it works, right? If that’s wrong, my Earth-to-Sun relationship comment, then we know absolutely nothing has changed since last year, as I am forever getting things like that wrong. I know I’m supposed to be horribly embarrassed but somehow never am! As I thought about doing a dip into the ol’ PG archives, which you should know are kept here on the internet and not in the Library of Congress YET, it dawned on me what I’d find: Germany. This time last year, I was in Germany. I went to Berlin last winter, during my break from grad school to visit my friend Claus and the trip was … Wow. But not like, Vegas-wow. More like Band-Aid-rip-off-wow-that-hurt-wow. Ow-wow, in other words. You’ve been reading me for at least a year and you totally remember The Germany Trip and you’re making this wince face. I am making a tired face, but I was wincing a second ago. You’ve been reading me for a long time but have a selective memory, so you’ve selected to forget how I traveled thousands of miles and found myself touring a Stasi prison in January, in Berlin, as fat, wet snowflakes fell on my head … for love. You’re new! And you’re interested now for sure. If that last one is you, boy, are you in luck! I happen to have a veritable bouquet of links for you. Perhaps begin with this post, wherein I announced my plans for the trip. Oh, what a happy lass I was, playing in the fields of low-cost international airfares. Then read this, where I’m a week out from leaving and full of anticipation and curiosity. Then move to this post, which finds me physically safe in Germany … but emotionally perilous. After that, it’s a domino, really; this post is pretty pathetic, tone-wise. Content-wise. Heartwise. (Or not-so-wise, I guess? Hard to say.) And this one, yikes. Anyway, that was pretty much exactly right now, a year ago, the Germany trip. My word but it was cold over there. Good hot chocolate, though, and I rode the bus all by myself. By the way, if either of us get too melancholy reaching into the mists of yesteryear, there’s always this post from a year ago next week, which is a script in which a woman (me) has a fight with her vacuum. Also, what’s up with mid-January bringing “ow” to me two years in a row? High school kids doing a musical. From such humble beginnings… Image: Wikipedia. If you like to put on little plays in your living room, this is the blog for you, as sometimes I write little plays. Some might be more “dialogues” than plays, but it won’t matter if you really want to have some fun. Grab a buddy and go back and forth! All these scripts are what my actress friend Kristina calls “two-handers”, or plays for two people. Here are three of my favorite scripts. One is from almost five years ago! If this is the way it goes, at least it will explain a few things for Lord’s sake. A fan favorite. And last summer, I got someone way better than Cynthia, by the way: I got Carmen! A picture of the Kosovo Ballet troupe performing “Flight towards the light” in 2013. Why not? Image: Wikipedia. I’m afraid Doctor Faustus is not finished Fausting himself into a froth, yet — and the clock is ticking. Since going two days without posting doesn’t feel right — but I really do need to keep turning pages and finish two big articles for the newspaper — tonight I’m going to lean on Pendennis to select from my robust archive not one, not two, but three posts he thinks are worth going back and checking out. Everyone wins! Wherein I talk about pesto and tell you how I make mine and possibly confuse you but it’s fun. A fan favorite from 2014. Still true. A year ago next month, I met one of the sweetest ladies ever, quite by a hilarious accident. I love you, Colleen. Pendennis would like you to note that a PaperGirl Archive Roundup like you have just been given might happen again in the next couple of days if I don’t get some of my homework done. He is very serious about this. Think of archive posts like reruns! Sometimes they’re sort of comforting. And now, a dash into the past because I found myself hating my stove this morning, and it was the second time I had hated it this week. Would you like to come with me into the past, when I first realized I felt this way? Larkin, detail. I have a knot I need to fix. Don’t look at it! Photo: Me. Tonight, because I am trying to take ‘er easy on the ol’ hemogoblins, a selection from the vast PaperGirl archive One year ago this very day, I wrote about my fear and love of hand quilting. The passage of time blows my mind. I mean, I was just there, quilting that quilt, sitting in that chair, watching The Office, wondering what grad school would be like. (I got my acceptance letter in late May, so the grad school thing was a fresh development, thus I thought/dreamed/stressed about it a lot.) The calendar read June, 2016, and wow, does June, 2016 seem like a distant, different world from June 2017. There’s a lot that can hardly be recognized a year later,: personally, professionally, romantically. Politically. Things certainly look different, politically-speaking, in 2017. You may heave noticed. My first hand-quilted quilt is one of my favorite quilts ever. It’s so bad. It looks like Sashiko, that’s how big the stitches are in some spots. But I love it so much. It’s mine and it’s my first. That’s enough. More than enough. Your first attempt at anything won’t be “perfect”, so do it anyway. Do it imperfectly. I give you permission. Tim Gunn backstage during New York Fashion Week, 2009. Image: Wikipedia. Remember when I met Tim Gunn at the Met in New York City? If you’re a new PaperGirl reader, you probably don’t know this happened at all — but it did! Tonight, I send you to that story because a) it’s a great one, and b) I have a paper due. Thank you to all my new friends. What fun it was to be with you, to dig quilts with you; what fun it was for me to wear Cookie Monster onesie pajamas while serving as your keynote speaker. I fear the Facebook photos of last night’s event, as a Cookie Monster onesie from Target is not what you might consider flattering, exactly, and that thing is gonna be all over Missouri quilter Facebook pages, I suspect — but I’ve only got myself to blame. And heck, I’d do it again. There was a velcro cookie in the pocket! I’m home in Chicago in my favorite chair. I’ve got a pile of work in front of me and an early morning. Therefore, I direct you to a post from this spring in which my dear friend Claus — I miss you terribly tonight, dear Claus, terribly, terribly, horribly — brushed my hair. Small gestures like that, they can take us into outer space. Airline meal ad detail, c. 1953. Image: Wikipedia. A PaperGirl Compendium: Diving In. There can be no other. 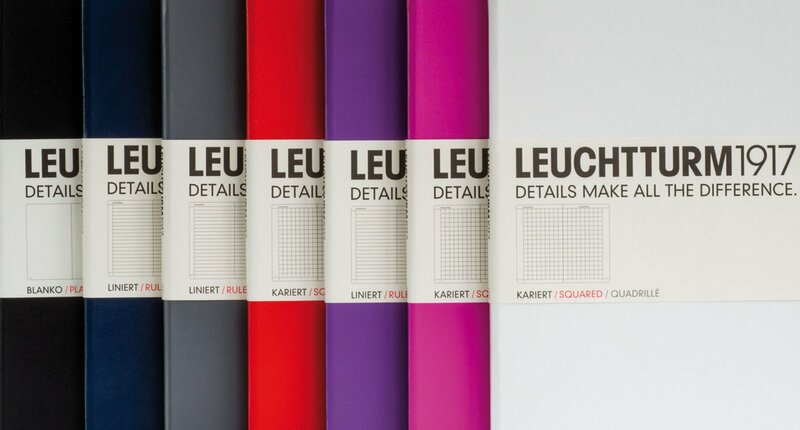 Leuchtturm 1917 Large Ruled Notebooks. I’m not sure that it takes a village to raise a child; a few capable women can get the job done before the rest of the village wakes up. My single mom did a solid job with my sisters and me, but she had help from friends. Katy, her best friend for a long time, is the woman I refer to as “my second mom.” Katy has soothed, instructed, corrected, encouraged, congratulated, and supported me my whole life; she’s grieved with me and sorted things out with me, too. She’s not my mom; she’s my second mom — and that’s a beautiful thing. Katy recently retired. We agree this is the beginning of an exciting time in her life. 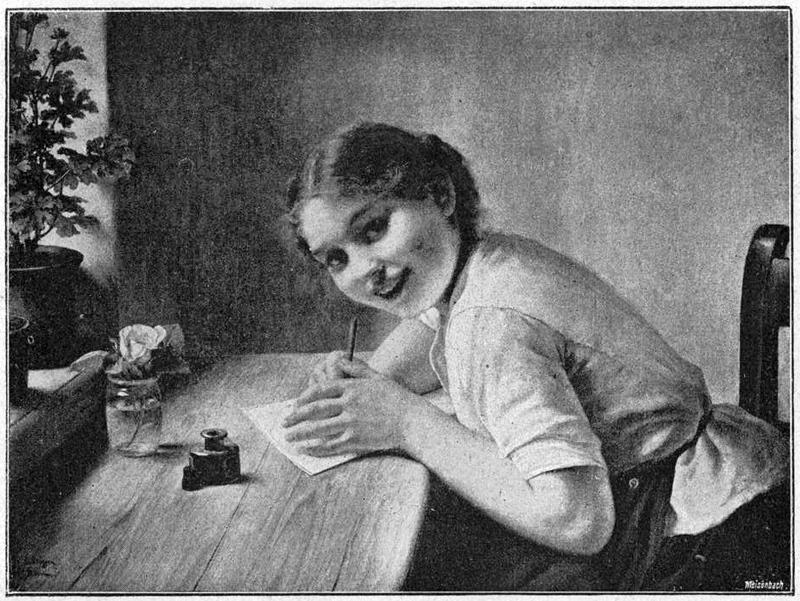 I sent her a present to mark the occasion, something I hoped could be of use: a Leuchtturm 1917 Large Ruled Notebook, a.k.a.,The Best Journal In The World. She might be compelled to write; in my view, major life transitions (really, all experiences) are best handled on paper. She might write songs in the notebook, or draw in it, or use it for grocery lists. She might not use it at all, and that’s okay, too. I just want her to have the best if she’s going to keep a journal of any kind. She deserves the best. noun (pl. compendiums or compendia |-dēə| ): a collection of concise but detailed information about a particular subject, esp. in a book or other publication. A collection — a book — of detailed information about a particular subject, systematically gathered. I want to make one. On what subject, you ask? Dolphins. I have to write about dolphins. No, the compendium would be about me. My life. As reported here, in PaperGirl, and in my offline journals (most of which are Leuchtturm 1917 Large Ruled Notebooks, you see? Ah!) Pictures, drawings, poems. Handwritten, typed, copy of all kinds, metaphorically written in blood. Metaphors. Similes. All kinds of things, but mostly words on the only subject on which I am an expert: myself. If I do it right, it could be a real slice o’ life page turner. I mean, come on. I’ve got near-death experiences, torrid love affairs, physical agony, an affinity for large cities, and countless journeys around America by plane. I’ve got an ongoing existential crisis, a thirst to make and bear witness to art, and I write silly poems for fun. It’s all here in the blog and what isn’t here is in the journals. Hot Tip: For those of you who own a copy of my book, look at the dedication. It says, “For A.” Can you guess who “A” is? “A” is my journal. I dedicated my book…to my book. That’s how serious I am about these things. And so into my suitcase to go to Seattle tomorrow, I have packed all my medicine, my special snacks, my clothes, laptop cords, and two journals, one from 2009, one from 2011. I need to start digging into my material. It won’t be easy. I will cringe. I might cry. I will roll my eyes and furrow my brow. That’s life. And it’s all there. Waiting. 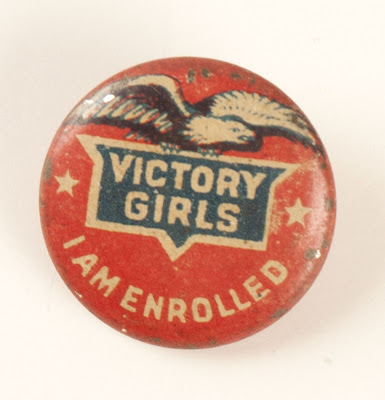 Pin for WWII Victory Girls, who were the real Rosie The Riveters, I’ve learned. It’s not that I have a huge thing for the WWII ladies, but the images are just so great. Good gravy that was awful! The server. It had problems. There had to be a migration. The migration, it had problems. I was without you. Lost. Lost at sea. Lost at sea with no peanut butter. Lost at sea with no peanut butter, no coffee. It was horrible! And over my birthday, too! What a rip-off! Well, anyhow, PaperGirl and the site are both back up, obviously, and I apologize for any inconvencience. If not being able to access my blog rates anywhere near an inconvenience for even a handful of people, why, I’ve made it in this world. Does that make my blog frivolous?